From 2017 onwards UPSC has changed syllabus and exam pattern for Engineering Services Examination, ESE (Popularly known as IES or ES ). The new syllabus includes one common Paper for all streams in preliminary stage namely ESE Paper-1. In ESE Paper-1 total 10 subjects are given which are listed below. 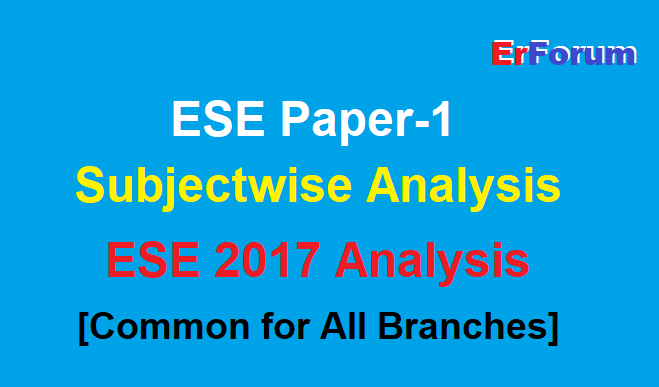 In this post, we are discussing weightage of subjects of ESE Paper-1 from most recent exam of Engineering Services Examination 2017. This analysis will be helpful to the aspirant of 2018 in making their priority. Information and communication technologies (ICT) based tools and their applications in engineering such as networking, e-governance and technology-based education. Visit here for ESE Paper-1 Handwritten Notes of all subjects. Click here for Additional Technical Subjects as per New ESE Syllabus.